Twitter Cards WordPress for Dummies is a comprehensive guide to implement and get proper post specific different Twitter Cards in more flexibly. No new SEO plugin is required if your Theme or Theme Framework can generate the minimum Tags. There is no meaning of trying this and that SEO Plugin for getting more features. Like Genesis Framework, Thesis Framework; practically there is no need of any SEO Plugin to generate these meta tags. Our target is to use less heavy Plugins – it is technically better to use a separate plugin for RSS feed, another for all Open Graphs. The reason apart from making the queries to MySQL database easier is, the individual plugin developers can have issue – late development, late updates etceteras. All SEO type plugins with time is changed for being the best – Headspace was number one once, then All-in-One SEO, then Platinum SEO like that. Do not get tempted by someone’s push of using a Plugin – the data can be collected and sold. This is another reason to use lighter WordPress plugins so that you can check the source code. It is not only possible, many developers actually add the function to collect data – you will never know, how your traffic data is getting stolen. A Theme / Theme Framework (we are taking Genesis 2.0 as the Standard) which will generate the Twitter or Facebookspecific meta tags. Not all Themes can add these by default, in that case you’ll need a separate plugin which allows to add anything as Meta tag, like Header and Footer Plugin. Second plugin is for dynamically generates Open Graph meta description, title, extract image url etceteras. This is not an image ! This is really embedded Twitter Card of this post. This Article Has Been Shared 1928 Times! Google Plus Interactive Posts can target your call-to-action button label from a large list of options programatically. It actually does not require any Plugin. 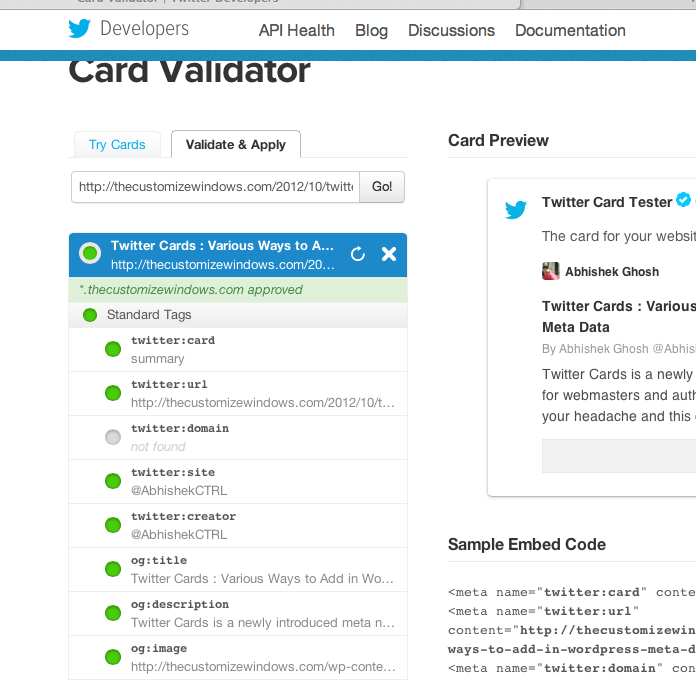 Cite this article as: Abhishek Ghosh, "Twitter Cards WordPress for Dummies," in The Customize Windows, August 21, 2013, April 20, 2019, https://thecustomizewindows.com/2013/08/twitter-cards-wordpress-for-dummies/.